On Friday morning, May 28, Rio Grande City Mayor Ruben Villarreal, along with IBC Bank and H-E-B, encouraged the public to participate in Operation Care Drop, a community-wide initiative supporting our service men and women overseas. 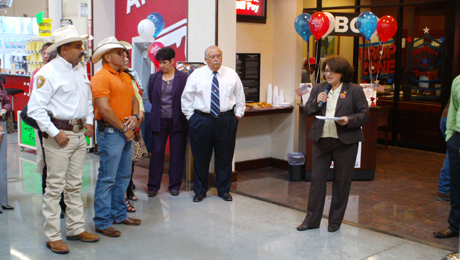 The Event was held at the IBC Bank located inside the RGC H-E-B. Bank representatives were on hand to share information about the program and guests can enjoy refreshments while they are doing their shopping. Through this care package donation drive, our nation’s troops are receiving support from the Zapata and Rio Grande City communities and more than 225 IBC branches and more than 65 H-E-Bs in Texas are serving as drop-off stations for much needed care package supplies. To help pack and ship the goods overseas to servicemen and women, IBC and H-E-B are working with Operation Interdependence®, the premier Civilian-to-Military Delivery System® in the U.S.